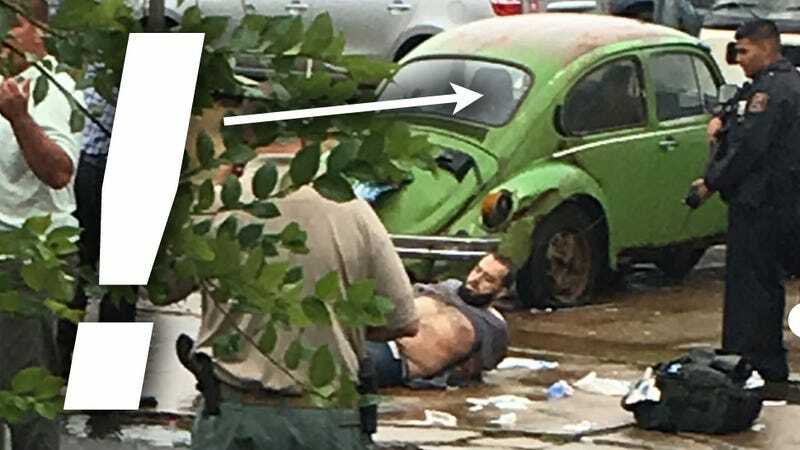 I’m not necessarily proud to admit this, but the first thing I noticed in that picture of the capture of the suspected Manhattan bomber was that bright green 1976 Volkswagen Beetle in the background. That’s because the takedown happened in front of Pegasus Bugshop of Linden, New Jersey, and the owner told me he’s relieved the chase ended when it did. The man on the ground is Ahmad Rahami, the man suspected of placing pressure-cooker bombs in Manhattan and New Jersey, one of which exploded Saturday night, injuring 29 people. According to news accounts, police chased Rahami down in Linden, NJ, and apprehended him after he reportedly shot a police officer. And the owner of Pegasus Bugshop saw that arrest go down. The shop is family-owned, and I spoke with the owner, who preferred that I not use his name. They have some interesting stuff there too, like a DKW Munga, an obscure off-roading vehicle built by modern Audi’s predecessor in the 1950s and ‘60s. He told me that as soon as he could, he “gave his wife and kids big hugs,” which is something I can understand entirely. It’s still amazing that nobody was killed in this weekend’s bombing. Hearing the owner of this old-VW repair and restoration shop describe the shock that this globally-watched event was ending right at the end of his driveway is a sobering reminder that there’s real people, with families and real lives in the background of all the alarming things we see on the news. This could have gone so much worse.